I’ve written before that signing up for the Academy of American Poets Poem-A-Day was one of the best things I could do for myself as someone still working their way to a place where she might be able to call herself a poet (still not there!). The poems themselves are such an eclectic selection of older works and newer poems that I am constantly exposed to new poetry and reminded of poetry that I once experienced but had slipped out of memory. Not only are these poems wonderful experiences by themselves they also inspire me to write poetry — they are often terrific writing prompts. In fact, sometimes the poem is the inspiration, making me think about something from my life or think about something in a new way, but often I also find inspiration in the “About this poem” section in which the poet shares their inspiration and/or the story behind the work. 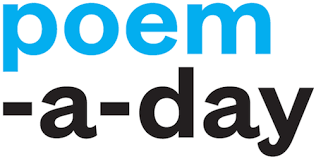 I recommend subscribing to the Poem-A-Day service even if you are not interested in poetry, because the poems and stories can inspire writers on many levels. If you are worried about email clutter (which I understand completely) then simply stop by and visit upon occasion when you are looking for inspiration. You will not be sorry.